We’re talking Comfort Food in this post, and a big shout-out to those of us who will be in the kitchen. Not me, friends. My only job on Thursday is to bring brownies to the home of my friend Colleen – who is also going twenty-first century with her Turkey Day feast. She ordered it from DeCicco’s in Yorktown, NY, and my plate will be heaped with those trouble-free dishes. No sweat here, we’re kicking the roasting pan to the curb! You haven’t lived until you’ve had mine: fresh sweet potatoes (or, in my house, yams) are peeled, sectioned and microwaved until tender (but not mushy). 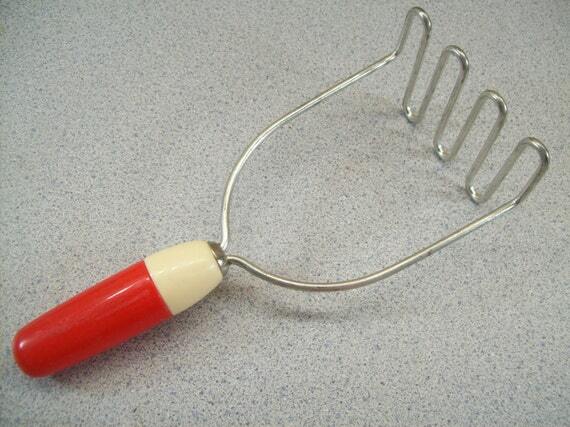 Wield your vintage potato masher until the (yams) are broken down, but retain character (lumps)(chunks). Blend in a carton of evaporated milk. Add some melted butter. A teaspoon of vanilla. Break up some walnuts or pecans into the mix, if you like the texture and flavor. A teaspoon of cinnamon! And lots of brown sugar. Don’t be shy, toss in a handful or so. Turn it out into a buttered casserole dish and give it 30 minutes or so in the oven at 350°. Yum. I miss my homemade cranberry sauce more than anything. You’ll want just three ingredients: a bag of cranberries from the store, a cup of white sugar, and 3/4 cup orange juice. Dump the berries into a colander and rinse, then pick them over to find the icky ones. Toss those out. Now, in a medium saucepan (2 quart or so), blend the orange juice and sugar. Set over medium high heat, and wait for some drama. When the sugar/juice starts to boil, toss in the cranberries. Stir, then settle back and wait for the mixture to boil again. Boil for FIVE MINUTES. Set a timer, woman, and watch that your heat is high enough to boil and low enough to keep from boiling over! The fun is hearing the cranberries pop and crack as they cook. Move the pan to a cold burner when the timer dings and stir it for a few minutes. Set it aside to cool completely. A pretty crystal dish will show off the jewel color of your creation. Other family favorites include dressing (not stuffing), made with herb bread baked in our bread machine, and a rice pudding recipe from the Southern Living Cookbook (Mom never made that one, but the cookbook was a Christmas gift soon after I married, and I treasure it – p. 77, Best Banana Bread Ever). Some dishes became standards over the years as times changed and my own children grew up. Cup Salad (five ingredients: open, dump, stir, chill) replaced the Ambrosia (tediously hand-sectioned oranges and coconut) Mom made for my father. A church cookbook I bought on a North Carolina beach vacation yielded a recipe that became a favorite each year at our transplanted New York table: a strange mix of lemon and lime Jello, mayonnaise, cottage cheese, chopped walnuts, and canned pineapple tidbits. When I set it on the table the first year, the assembled company recoiled at first. After their first tastes, however, they decided it was too delicious to have the plain-Jane name, “jello salad.” A raucous Turkey-day debate finally re-named it: Martian Salad. And so it goes. Every generation finds its way to a new variation on the meet/greet/eat/drop theme of the day. In our own home, Andrews standards (creamed onions, creamed potatoes, turnips) never made it to the table. Hosford (maiden name) traditions like mince pie and green bean casserole were also set aside in favor of the new tastes and habits of our generation and our children’s. This is why I’m grateful. In spite of the past year’s trials, I have friends who are eager to see me, and my brownies. My children will call home. One will probably celebrate with friends and his father; another is moving into a new home, and sitting down with her sweetheart’s family. That connection, that love, those memories. They keep us grounded. Prev Week 3: the Mermaids Dive into NaNo Next The Alethea Extravaganza: 2 New Books Out Today!!! Thanks for sharing, Susan! Sounds delicious! Hugs, Dana Mermaid! Happy Thanksgiving! I remember that pie crust lesson! Your pie turned out pretty good, too. And I miss you!!!!! Maybe the stars will align and bring me in your direction… Wouldn’t it be nice to not have a date book for upcoming events, but a to-do list for dreams and possibilities? I’d like to have that book.